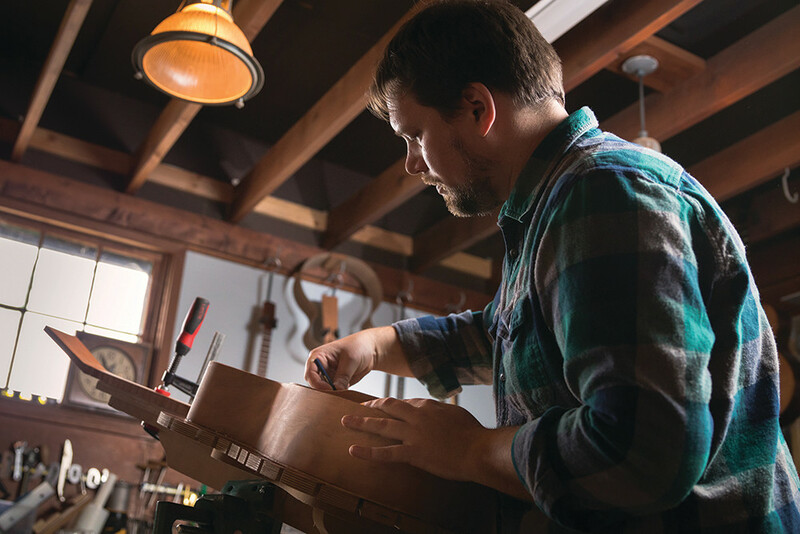 Undistracted, Dan Collins needs only three weeks to turn raw lumber into a sleek, one-of-a-kind guitar. If Collins was a full-time luthier, and he spent every day cutting and shaping, he might sell a handmade guitar every month for $4,000 to $10,000. But Collins doesn’t rely on this wondrous ability. Instead, he teaches others the art of guitar making at his school, Shady Lea Guitars, in Peace Dale. Collins’ workshops attract four or five students at a time, and over the course of many months, these pupils transform their wood into musical instruments – acoustic, steel-string, and even ukuleles. Collins’ life is full of surprises. He’s studied a variety of visual arts, from pottery to painting, as well as photography at the Hallmark Institute. In 2001, Collins offered to photograph Vermont luthier George Morris for a then-forthcoming book about guitar-making. Morris was a family friend, and instead of payment, Collins asked to spend the winter apprenticing. Though Collins can play guitar and loves music, he doesn’t perform publicly. Instead, he is a co-founder of the Pump House Music Works, the beloved music venue that occupies the same historic space as Shady Lea Guitars. Guitar-making classes take place in an adjacent workshop, which is outfitted with workbenches and milling machines. In the concert hall, Collins sees singer-songwriters every week, but he doesn’t foist his guitars on passing musicians. Sometimes he’ll take commissions from friends, but he focuses most of his creative energy on the classes. While many craftsmen grumble about mass-produced facsimiles, Collins feels little threat from the cheaper models pouring out of faraway factories.